There is a lot you can do with hanging baskets to accent your home and your garden. 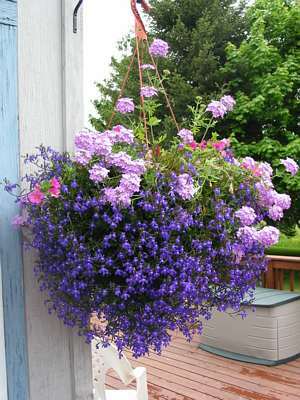 There are a lot of hanging baskets readily available in the market, but there is also an advantage to making your own. No matter what you need your basket to do, making your own gives you an opportunity to create colour combinations that best suit your needs. A combination of trailing plants of the same variety with three or four colourful plants at the top will result in a rich and healthy looking hanging basket. In this case – size does matter. The volume of the basket is directly related to the amount of water the basket can retain. If you select a basket that is too small, you will have to water it daily. Larger basket will also make columns or posts look more in scale with your house or landscape. To fully cover basket, you will need to overlap two rectangular section of the liner. Remember to allow enough length of each piece to overlap the basket so that when you fill it with soil, you will still have piece that will spill over the edges. overlapping will also add the benefit of slowing water flow out of the bottom. Use good quality potting soil and press it firmly against the bottom and sides of your basket. You need to do this so that you have a firm background to cut against when you make slits for the first row of plants. Keep the soil level about 4-6 inches above the bottom of your basket to complete this step. Doing this will help aeration and watering – and all you will need is a piece of slotted drainpipe, about 8-10 inches long. Adjust the drainpipe, so taht you have it about 2-3 inches above the final soil level – that will prevent it from filling with soil. You will also want to make sure that the drainpipe doesn’t end up sitting on the bottom of your basket – that would result in water simply draining right out. Frist – trim your liner and using a sharp object, make small incisions just above the current soil level. Carefully poke through the root-balls of the plants from the outside. Small plugs or cell pack-size annuals work the best here, since they minimize the since of openings in your liner. If you make larger hole, you will have a problem with soil spilling out and young plants washing out during watering. Keep adding layers of potting soil, cutting slits and inserting rows of plants. Using staggered pattern work the best – do this until you readch top of the basket. You can top off your basket with some upright annuals or even some small grasses. Get creative, mix colour and types of plants and enjoy the results! And please send in your comments, suggestions and experiences – your input is always welcomed and much appreciated! The bottom blue layer are lobelias, there are a few petunias above that, then the top – trailing verbena. what is those flower name in the hanging basket?where can find it? They do look beautiful but I am not 100% sure of the exact names of them. When I am planning a basket, I usually visit my local farmer’s market, put flowers together that I like and it works! You could print out the picture and go to your favourite garden centre – sometimes it is the best thing to do as most centres have very knowledgeable staff. Thanks for your comment and hope it works out for you!